Our authentication portal and identity provider have became a member of eduGAIN identity federation. With this integration it is now possible to access more than 1800 online web services most of which depend on eduGAIN federated login. To read more please to eduGAIN website. At 8 p.m. of May’s 25th, a necessary technical intervention will make Fénix and all IST, IST-DSI and ADIST administrative applications offline. We apologize for any inconvenience this downtime will cause you. Since April 4th, the domain “tecnico.ulisboa.pt” is being supported by DNSSEC (Domain Name System Security Extensions). This change allows a step further towards an improvement in access security to computer services hosted in IST. We inform you that on the 16th of December, 2015, at 7 PM the data network of Universidade de Lisboa will have a technical interruption to reorganize the connections and traffic routing. Exceptionally on the 17th Dec. 2015 DSI front office will close at 3:30 PM. We apologize for the inconvenience, however, we will return our normal schedule on the other days. Técnico’s webmail system at https://webmail.tecnico.ulisboa.pt will have a new design on Monday, 7th December 2015 around 3 PM. The structure will be similar to the current version with no significant changes in how to use the webmail system. We inform that the logins to the application Ephorus were cancelled in October by Turnitin manufacturer throughout ULisboa, following a failure renewal of this software. The software in this contract is the Urkund, and wait for details about the disposal. We inform that the logins on the website of Ephorus / Turnitin are temporarily blocked. Following the acquisition of the company by Ephorus Turnitin, coinciding with the renewal of the current contract, the manufacturer maintains the logins already allocated suspended throughout ULisboa. We inform that is possible to download office 365. The portal Office365 for the domains *.ulisboa.pt has temporarily inhibited the use of several applications out of the cloud. We hope that the situation normalize within a few days. Today, 08th June, after 7 PM will be performed a technical intervention to set up the new version of the Fénix system (version 5). The system will be unavailable between 19h and 20h. We apologize for the inconvenience and appreciate the feedback to be sent to: dsi@tecnico.ulisboa.pt. 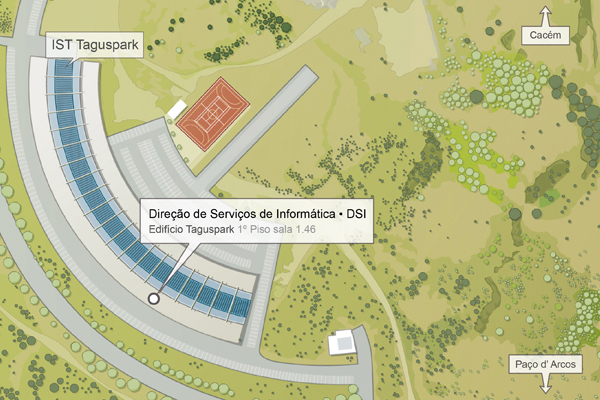 On 4th June 2015 will be available at Aplicações Centrais a new interface to visualize data from Módulo de Gestão de Projetos (MGP). This new interface will allow users to obtain a set of information by coordinator, cost center and project. Computer and Network Services offers the possibility for IST teachers to test Ephorus (https://www.ephorus.com/pt-pt/) for free until 31th Dec. 2015. Microsoft Office365 is now available to IST community. Read more here. On the 23rd of January, after 10 PM a technical intervention will take place to set up the new version of the Administrative Applications for IST, IST-ID and ADIST. Therefore these services will be unavailable around 3 hours. On the 19th January, after 7 PM will be performed a technical intervention to set up the new version of the Fénix system (version 4), developed by FénixEDU Team of DSI. 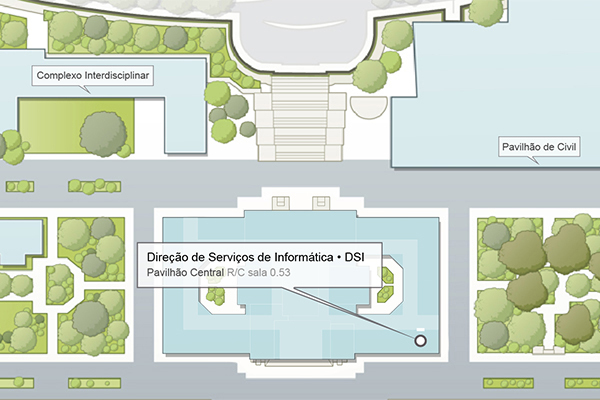 Instituto Superior Técnico’s Computer and Network Services (DSI) established, last year, a partnership with Google, making this school a pioneer Portuguese institution with Google Maps Indoors, a feature that allows users to access the internal maps of buildings/Campus. Exceptionally on the 17th Dec. 2014 DSI front office will close at 3:30 PM. On the 29th of September, after 6:30 PM a technical intervention will take place on the Administrative Applications for IST, IST-ID and ADIST. Therefore these services will be unavailable around 2 or 3 hours. We apologize for this temporary inconvenience. Yesterday, 30th of July, due to a failure in a Network Attached Storage, several operating systems that depended on this where affected by this problem. You can send messages up to 25 megabytes (MB) in size. If you would like to send attachments that are larger than this, please use “FileSender” from FCCN service . On the 28th of May, after 7 pm a technical intervention will take place at the web service http://fenix.tecnico.ulisboa.pt therefore the web service will be unavailable around 6 hours. The Ignition event of the FenixEdu project is integrated in the XXI SINFO. On Thursday, February 27, the team of the FenixEdu project will be participating in SINFO, throughout the day. It is necessary to update the OpenAFS client. Due to a security issue the old clients will stop working on the 5th of February. On this day DSI will perform an upgrade to OpenAFS servers which is incompatible with older clients. The Fénix system will be taken off-line for maintenance during this night. The expected system downtime is about 2 hours and will begin around 21h00. Since the creation of the new domain @tecnico.ulisboa.pt the e-mail addresses of Técnico have been transferred to xxxxxxxxxx@tecnico.ulisboa.pt which means that the addresses remain basically the same, just the domain changes. Welcome to Unidades do Instituto Superior Técnico . This is your first post. Edit or delete it, then start blogging!